I realised this morning that I’d completely forgotten to post a blog in April! Sincere apologies for that. I blame being so busy but in reality it was probably more to do with my forgetful brain! So much to mention – where to start!! 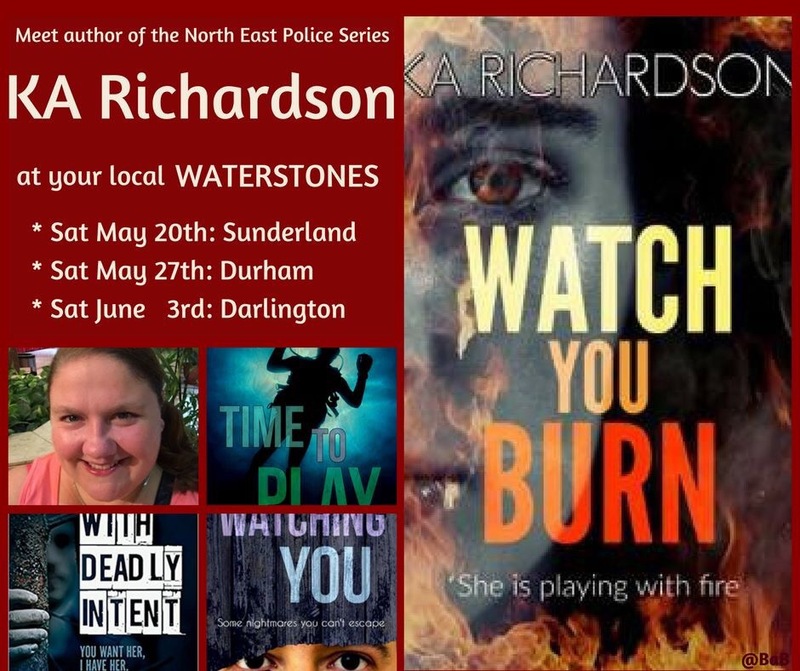 You’ll probably have noticed the fourth book in the north east police series is out now – Watch You Burn was released on 2nd May by my fabulous publishers, bloodhound books. And it’s been a crazy fortnight since then! The book is doing really well in the Amazon kindle charts – getting to a cracking 186 before starting to drop back down a little slowly. Thanks so much to everyone who bought it! And also to everyone who got I’ve been watching you and time to play whilst they were on promo. Sincere apologies to those few who ordered from Amazon and somehow received the I’ve been watching you text inside the cover for time to play – it was a glitch on the Amazon end and I’ve been reassured that anyone who received the wrong copy can speak to Amazon who will forward on the correct version. Huge thanks to all the lovely bloggers who featured watch you burn as part of their blogs on the tour! Very much appreciated and lovely to chat to those of you I hadn’t spoken to before!! Special thanks to Caroline Vincent who’s responsible for the lovely advertising poster above which lists the signings I’ve got booked in over the next few weeks. She’s just fab. I’ve had cause to look back to a year ago and I have to say, my god how far I’ve come! It’s been a busy year – Escape and With Deadly Intent were published March/April time last year by caffeine nights, then I made the decision to approach Bloodhound Books who offered me a 3 book deal, and have since offered another 3 book deal so rest assured, fans of the north east police series, I’ve no intention of stopping yet!! Bloodhound published I’ve been watching you in June 2016, then Time to Play in September. They have just released Watch You Burn and I’m working now on book 5. Have I mentioned how much I love writing? Only like every week for the last year I’m sure, but I do. I still find it amazing that I can just lock myself away with my laptop and produce these stories that lovely folk just like you want to read! It still blows my mind! I’m so very grateful to each and every person who buys one of my books, and I love reading the reviews. Well, most of them. The 1* ones not so much but I do still read them in hope they’re constructive and I can learn from them. We’ve had a lot going on as the Femme Fatales of the north east too. This consists of myself, Sheila Quigley, Danielle Ramsay and Eileen Wharton. We work as a panel and have been doing events in Waterstones stores, have some booked in for libraries and have even been on the radio. We would be happy to attend any other venues that would like to feature our Q&A sessions too! So if you’re looking for a group of women who are both self-published and published via traditional publishers then get in touch. Between us we have 23 books out so that’s a lot of experience and stories for us to chat about. In the upcoming weeks I’ve got signings booked in as per the poster above, and we’ve become involved in doing something called Noir at the Bar. We used to attend these as writers but have now branched into running them as events. Keep an eye on Facebook for further details of upcoming events. This entry was posted in Blog Posts on May 17, 2017 by Kerryrichardson77.